Anton Yurin, a ballet teacher, discovered snowboarding in Japan. Yurin recalls how he quit his job, left his home and found bliss in his new passion in snowy Sochi mountains. My interest in snowboarding began 10 years ago. I was then teaching ballet in Japan. It was on the coast of the Pacific Ocean that I first got up on a surfboard. I loved the feeling of freedom, new emotions and a rush of adrenaline coursing through my blood. When I returned to Russia, I decided to change my life. I gave up ballet, gave up working in St. Petersburg and moved to the mountains near Sochi: to learn how to snowboard. Living in the mountains is pure bliss. I love the climate (exactly like the subtropics of Japan), the fresh air and the way of life on the slopes. I immediately found myself the best teachers. I knew very well how important it is for a novice to learn from a professional sportsman. Most important, I learnt to forget about my work, my problems, my fears and give myself up entirely to my instructor and have faith in my abilities. I’ve had injuries several times in my life: dislocations, sprains, concussions. The most serious of these caused me some memory loss. We were in the mountains during a photo shoot of snowboarders. We were doing tricks, jumping off ski jumps. For one shot, I needed to perform a jump without a helmet. I took off my helmet, which proved to be a potentially fatal mistake. For three days, I didn’t recognise my friends and couldn’t remember who I was. It took me six months to recover. But it was clear to me that these injuries resulted from sheer carelessness. Always wear elbow and knee guards and, most importantly, a helmet. And don’t ever drink when you’re snowboarding. There are two types of snowboarding: Free-riding and Freestyle. 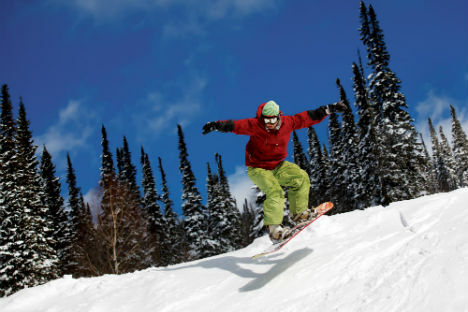 Free-riding is snowboarding off regular runs on unprepared slopes. Here speed and directional movements are important. Here you have a stiff board and strict direction. Here you ride on natural terrain with all sorts of obstacles, hummocks and trees. Freestyle, by contrast, is all about technique. Freestylers ride on a flexible board, which allows them to perform various jumps and spins and turns. It is the technical dexterity with which these tricks are executed that freestylers are typically judged at competitions. The most difficult freestyle trick that I have mastered is called a Korg 540 jump: with your legs over your head, you spin around your own axis 540 degrees, in other works, you do 1.5 rotations in air. Russia has many downhill- skiing resorts: Elbrus, Kirovsk and Krasnoyarsk. But the best one of all, I think, is in Sochi. It’s called Krasnaya Polyana and right now it is the focus of massive construction in the run up to 2014 Winter Olympics. I’ve seen the new slopes and they are very modern, just like in Europe. But sometimes you find good slopes in the most unexpected places. In India, for example. There is a resort in Gulmarg in Jammu and Kashmir where some of my friends live and they say it is a wonderful place to spend one’s life and enjoy the thrills of snow and snowboarding.